I spent a week on vacation in CO in June, where I stayed in Estes Park and had the good fortune to explore the surrounding area and the Rocky Mountain National Park. What a gem of a place with such natural beauty. 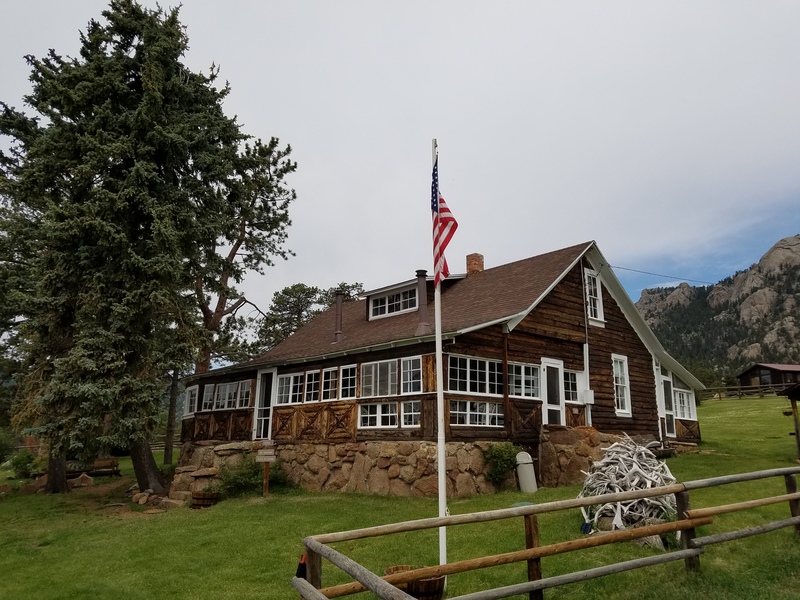 We visited the MacGregor Ranch Museum just outside Estes Park and had a tour of the house and grounds nestled against the backdrop of spectacular rocky cliff faces in the Black Canyon Creek area. The MacGregor Ranch is a showplace of early life among settlers and homesteaders in the early Colorado Territory. 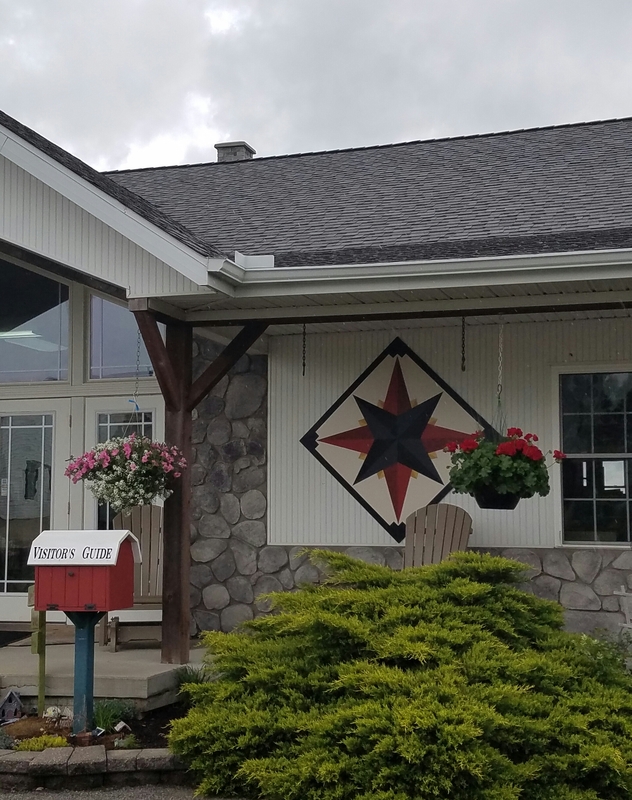 Founded in 1873 by Alexander and Clara MacGregor, and left in trust by their granddaughter Muriel MacGregor, the Ranch today is a working cattle ranch and a youth education center. There were a small number of quilts on display in the bedrooms and I was particularly drawn to this one made by Clara MacGregor in the early 1900’s from 1890’s fabric scraps. I’m sure all these fabrics have their own stories. There’s a good chance that the triangles were cut out of leftover pieces from dresses or other home made household items. Perhaps Clara’s friends gave her some of their scraps to increase the variety of fabrics in the quilt. The result is beautiful. 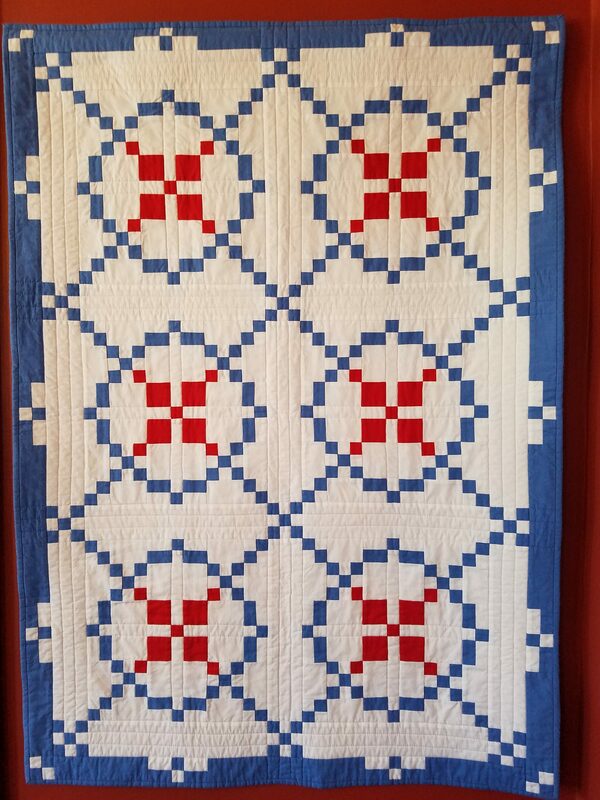 Here is a beautiful Burgoyne Surrounded quilt in red, white and blue. 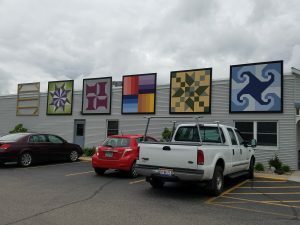 I recently visited the La Conner Quilt & Textile Museum and saw the latest exhibits. 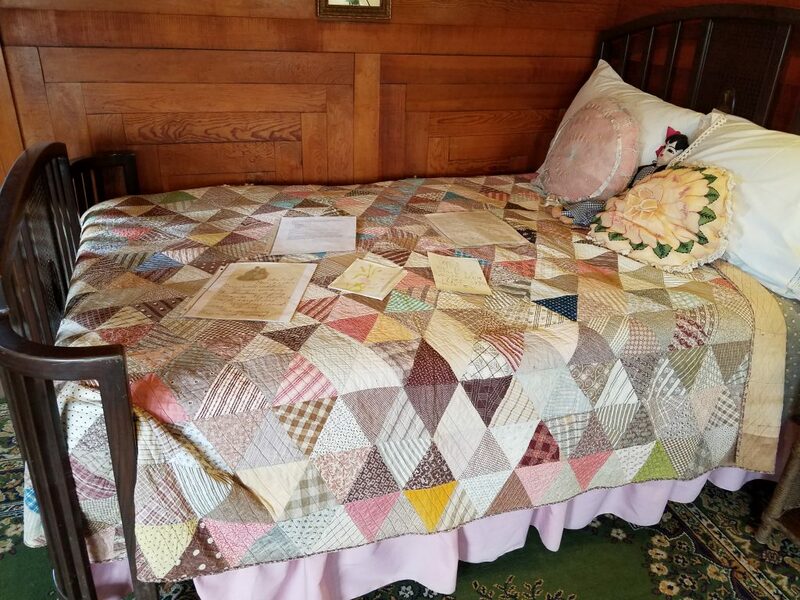 On the ground floor, there is a display of Colonial Revival Quilts made by members of the American Quilt Study Group. Participants create a quilt which is copied from, or inspired by an existing antique quilt. This example, (32” x 46”), was made by Anita Loscalzo from Dover, MA. This traditional pattern reflects historical events during the War of Independence. The British Army led by General Burgoyne was surrounded at the Battle of Saratoga which resulted in their surrender in October 1777, and convinced the French to ally themselves with the Americans. Anita used red in the large and small squares in the center of each block to symbolize the surrounded British army of redcoats. This quilt exhibit also includes several beautiful appliqué Colonial Revival quilts. On the upper two floors of the museum (where photography is not allowed), there are many exquisite hand-pieced and hand-quilted Japanese quilts made by Sachiko Yoshida and her students, utilizing antique kimonos. The display of Colonial Revival Quilts runs until the end of August, 2016 and the Japanese quilts will remain until early October, 2016. 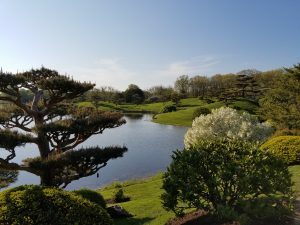 In May, I spent a day exploring Shipshewana in the heart of Amish country in Indiana. See previous blogs for Lolly’s Fabric Store and Little Helpers Quilt Shop. The Amish are quilting masters and an expansion of this craft is to paint quilt blocks on large wooden panels which are displayed on the outsides of buildings. They are beautiful. Some are quite large and colorful such as these on the outside of the building that houses the Yoder Department Store and other shops. Usually the patterns painted are those of traditional pieced quilt blocks. 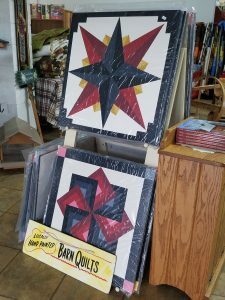 You can purchase these Barn Quilts, as they are called, at the Little Helpers Quilt Shop, 1,030N 1,000W, on the outskirts of Shipshewana. The ones shown above are about two feet square and there is a nice assortment of patterns available. The pictures below are of the outside of the Little Helpers Quilt Shop. 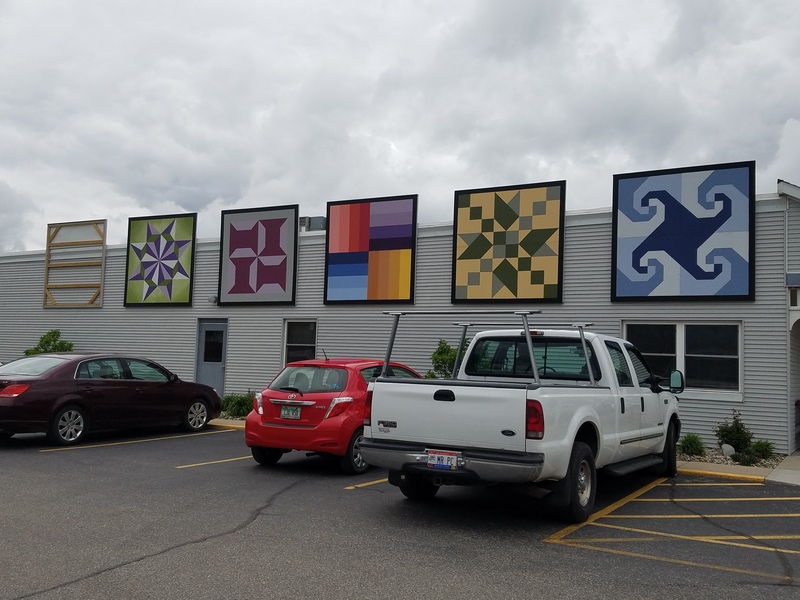 It was rather a grey day, but these barn quilts still look very attractive and add color to the outside of the building. 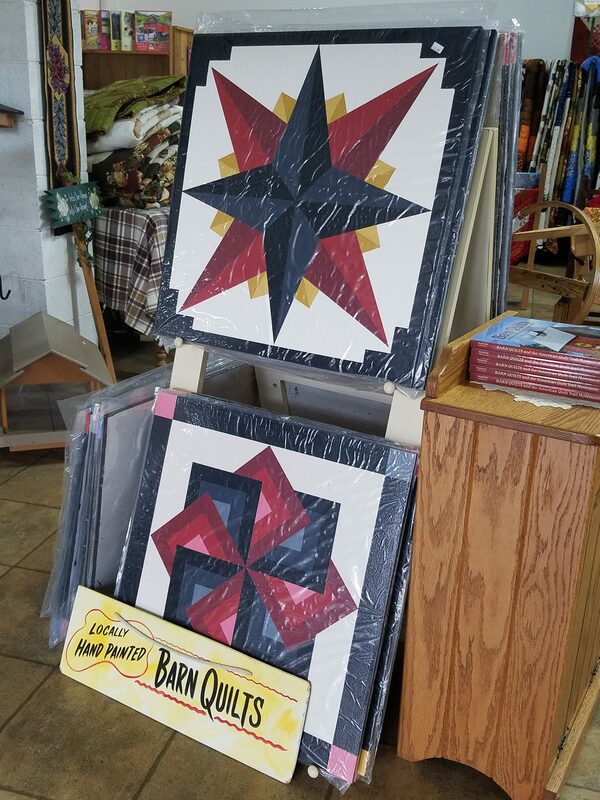 Several other states boast barn quilts. Perhaps there are some near you? 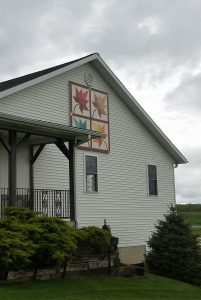 In May, I visited IL and taught at the Village Quilters Guild in Lake Bluff/Lake Forest. 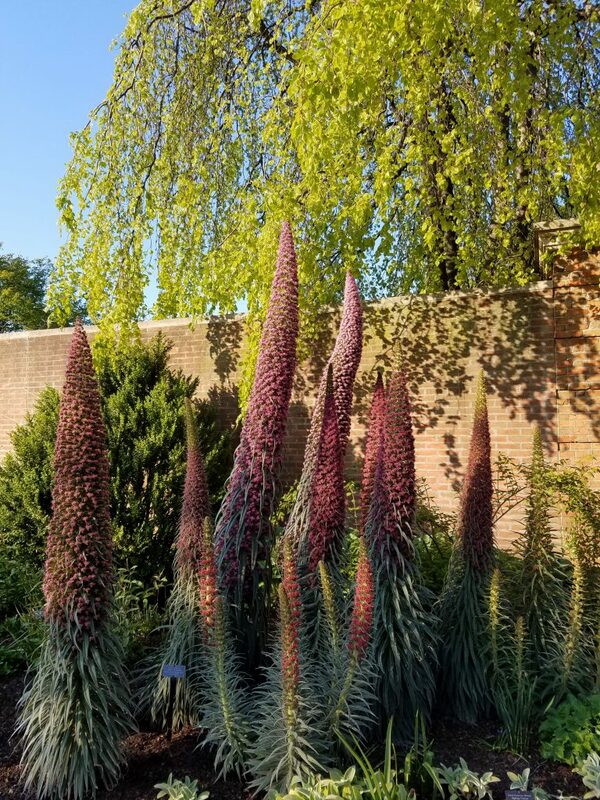 After my workshop, one of my students took me to the Chicago Botanical Gardens. 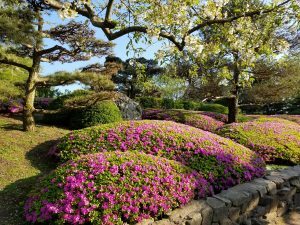 What a fabulous place on a par with other world class gardens I have visited, such as Kew in London and Kirstenbosch in Cape Town. 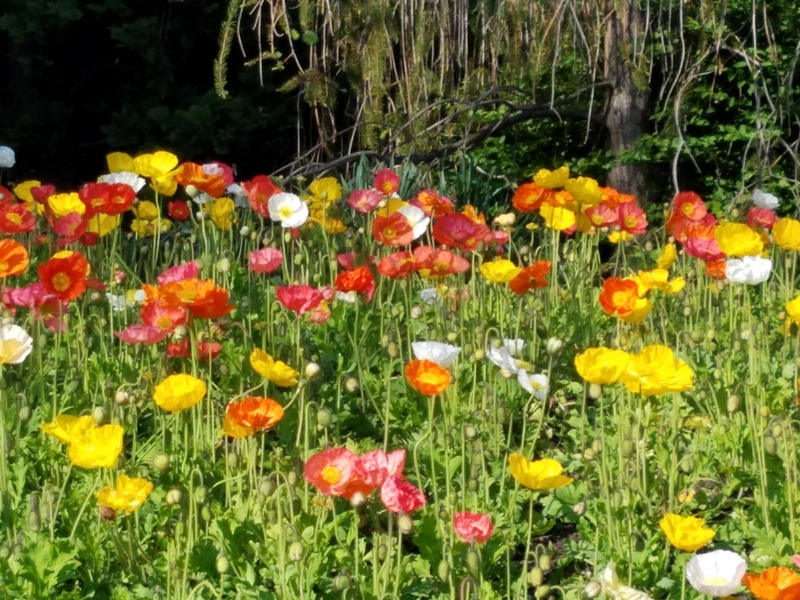 I never quite know where my inspiration comes from for quilting, but I love flowers and it seems that in gardens and nature, the colors never clash. I think that my observations of many color combinations in these places has made me more adventurous in my choice of fabrics. It’s not only the colors, there are so many differing textures and shapes. Look at these magnificent jewel towers. As you can see, it was a beautiful clear sunny day. The late afternoon light made the colors brilliant as well creating gorgeous shadows. 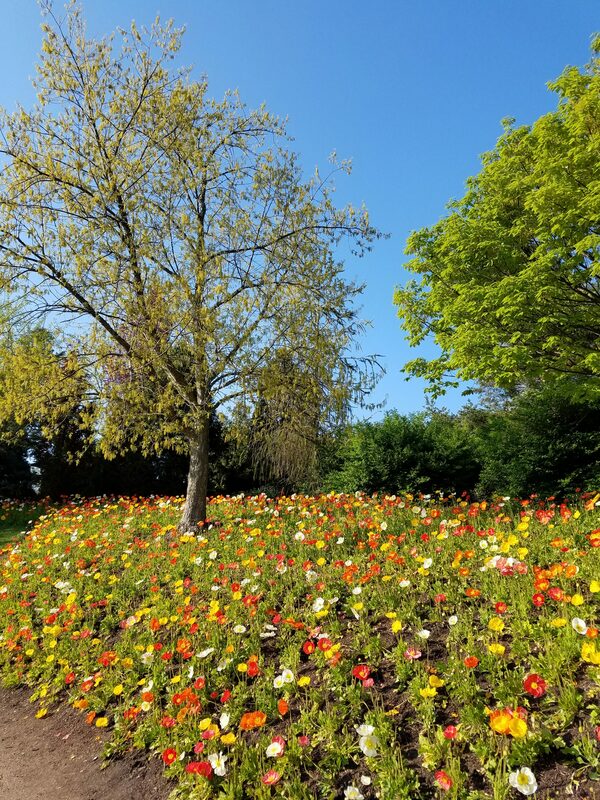 Look at all the shades of green from the fresh chartreuse of the leaves on the tree, to the darker evergreen and the dusty green of jewel tower leaves. The brick wall provides a nice backdrop. 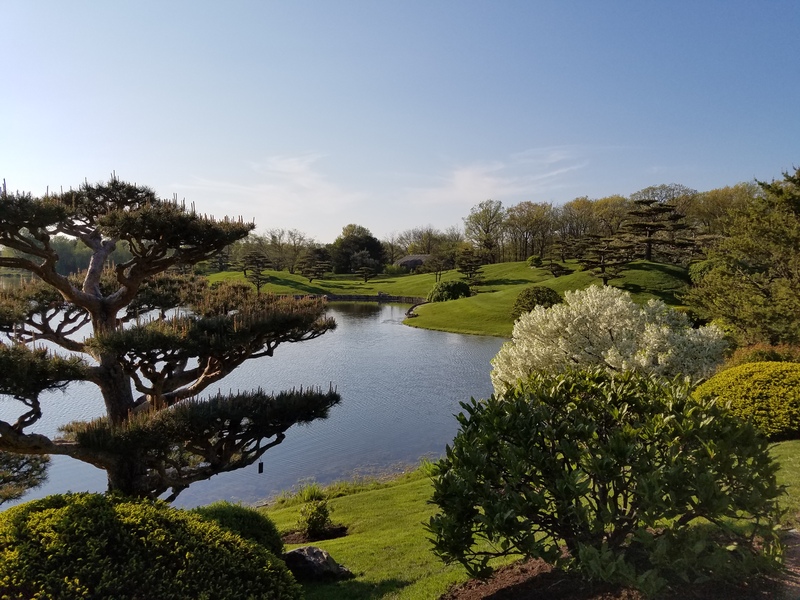 The formal Japanese gardens were immaculately manicured and the trees and shrubs were scaled to ideal proportions so that all the components fit together in perfect harmony. 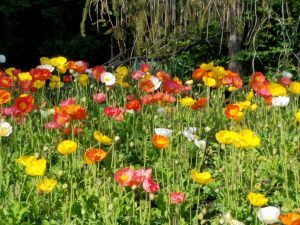 Then there was this lovely meadow of red and yellow poppies and all shades in between with a few white ones thrown in too. 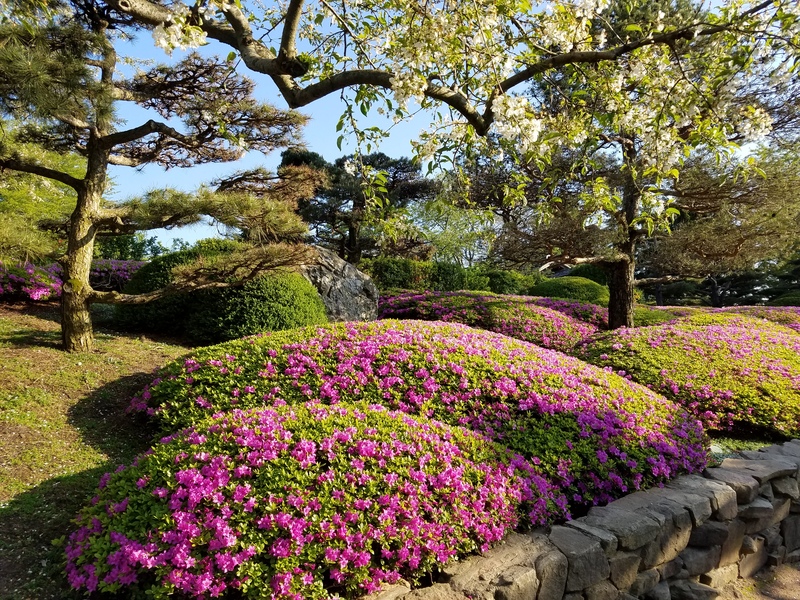 If you are in Chicago and have time to venture north a little way, I can highly recommend these gardens. We only saw about half of them in an hour and a half. You could easily spend all day there. Happy 4th of July! 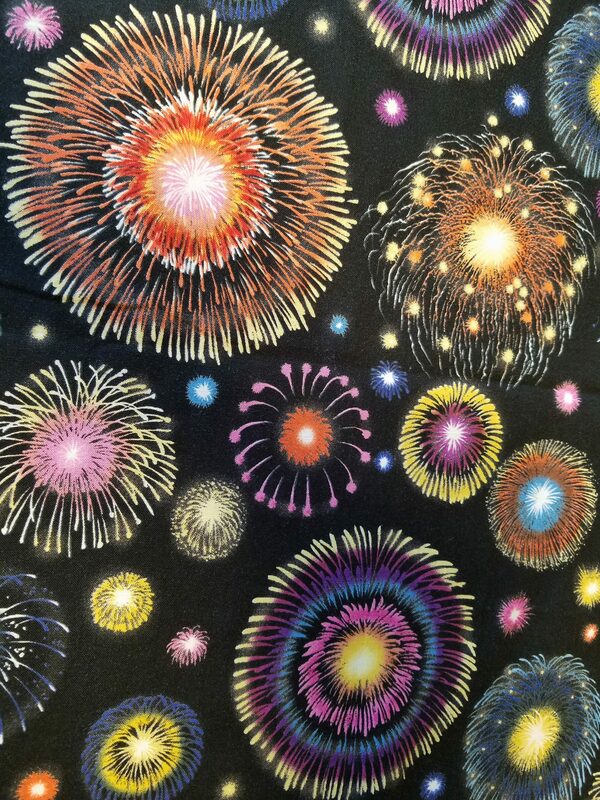 Here are some fireworks from my fabric stash!